Wagner disease is a rare hereditary vitreoretinopathy characterized by an anomaleous vitreous associated with myopia, cataract, chorioretinal atrophy, and peripheral tractional or rhegmatogenous retinal detachment. About 100 patients with Wagner syndrome from only a few pedigrees have been described in the literature. Not more than 50 families or simplex cases of VCAN-related vitreoretinopathy have been reported, including families with ERVR (erosive vitreoretinophathy). Wagner syndrome is a very rare disorder. Not every clinical finding listed above is observed in every affected individual. The hallmark, however, is the empty vitreous. Wagner disease is a connective tissue disorder affecting the collagen and is associated with mutations in the CSPG2 or VCAN gene (5q13-q14). The human VCAN gene contains 15 exons spanning more than 90 kb. One of these, exon 7, is used in an alternative splice variant. VCAN, encoding the large extracellular matrix proteoglycan versican, is the only gene in which mutations are known to cause Wagner syndrome and erosive vitreoretinopathy (ERVR). VCAN encodes chondroitin sulfate proteoglycan-2, also known as versican. Versican constitutes 5-15% of the total protein content of the vitreous gel. It is a large proteoglycan that forms large complexes by binding to hyaluronic acid and other vitreous structural molecules. Versican is a large extracellular matrix proteoglycan that is present in a variety of human tissues. Versican is a large chondroitin sulfate proteoglycan with an apparent molecular mass of more than 1000kDa. Versican belongs to the lectican protein family, with aggrecan (abundant in cartilage), brevican and neurocan (nervous system proteoglycans) as other members. Versican is also known as chondroitin sulfate proteoglycan core protein 2 or chondroitin sulfate proteoglycan 2 (CSPG2), and PG-M. These proteoglycans share a homologous globular N-terminal, C-terminal, and glycosaminoglycan (GAG) binding regions. The N-terminal (G1) globular domain consists of Ig-like loop and two link modules, and has Hyaluronan (HA) binding properties. Versican occurs in 4 isoforms : V0, V1, V2, V3. The central domain of versican V0 contains both the GAG-α and GAG-β domains. V1 isoforms has the GAG-β domain, V2 has the GAG-α domain, and V3 is void of any GAG attachment domains. The GAGs, being composed of repeating disaccharide units, contribute to the negative charge and many other properties of proteoglycans. The C-terminal (G3) globular domain consists of one or two Epidermal growth factor (EGF) repeats, a C-type lectin domain and complement regulatory protein (CRP)-like domain. The C-terminal domain binds a variety of ligands in ECM which contribute significantly to the functions of lecticans. The role of versican in cell adhesion, migration, and proliferation is extensively studied. Versican is often considered an anti-adhesive molecule. Considering the large size (>1000 kDa) and hydration capability of versican, it is possible that the interaction of integrins (large family of cell adhesion molecules) with their cell surface receptors is sterically hindered. The diagnosis is based on clinical features. Molecular analysis of mutations confirms the diagnosis. The differential diagnosis is with Stickler's disease, the disease Goldmann Favre, the familial exudative vitreoretinopathy, the vitreous coroidoretinopatia autosomal dominant (ADVIRC), the autosomal recessive vitreoretinopathy and Jansen's disease. VCAN-related vitreoretinopathy comprises the phenotypic continuum of Wagner vitreoretinal degeneration (Wagner syndrome) and erosive vitreoretinopathy (ERVR), two disorders that were previously thought to be distinct entities based on clinical findings. 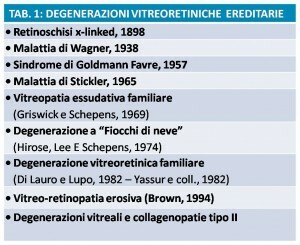 Wagner syndrome, the first reported inherited vitreoretinal degeneration, was described by Wagner . ERVR was described in 1994 as a new clinical entity with some features that overlapped with Wagner syndrome. Once the molecular basis of Wagner syndrome, originally described by Wagner in 1938, and ERVR, originally described by Brown and colleagues in 1994, was identified, the high similarity of the clinical phenotypes and the fact that both were caused by mutations in the same gene led to the conclusion that both were descriptions of the same disorder, which has been called VCAN-related vitreoretinopathy. The vitreous body is a connective tissue transparent gelatinous structure, colorless, non-vascularized nor innervated. 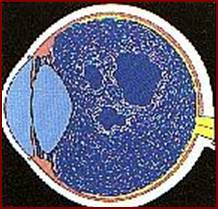 It occupies about 4/5 of the ocular volume. It contributes to the shape and size of the bulb. These filaments are described by the patient as "flying flies". Wagner disease is inherited as an autosomal dominant trait with near complete penetrance but variable expressivity. Wagner syndrome has been reported in families of various ethnic backgrounds including white, northern European, Japanese, and Chinese. Refractive error is corrected by spectacles or contact lenses. 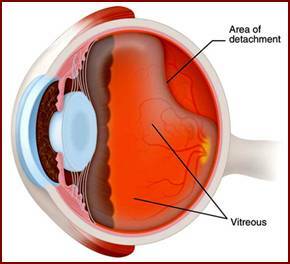 Visually disabling cataract is treated by cataract surgery. Phacoemulsification and implantation of an intraocular lens in the capsular bag has become the widely adopted standard procedure; however, cataract surgery in patients with vitreoretinopathy and possibly preceding vitrectomy can be difficult and should be performed by an experienced surgeon. Posterior capsule opacification after cataract surgery is treated with YAG laser capsulotomy. 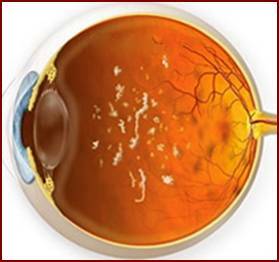 Retinal breaks are treated with laser retinopexy or cryocoagulation if no retinal detachment is present. Vitreoretinal surgery is indicated for retinal detachment, vitreoretinal traction involving the macula, or epiretinal membranes involving the macula. Annual ophthalmologic examination by a vitreoretinal specialist is indicated. The majority of GAGs in the body are linked to core proteins, forming proteoglycans (also called mucopolysaccharides). The GAGs extend perpendicularly from the core in a brush-like structure. The linkage of GAGs to the protein core involves a specific trisaccharide composed of two galactose residues and a xylose residue (GAG-GalGalXyl-O-CH2-protein). The trisaccharide linker is coupled to the protein core through an O-glycosidic bond to a S residue in the protein. Some forms of keratan sulfates are linked to the protein core through an N-asparaginyl bond. The protein cores of proteoglycans are rich in S and T residues, which allows multiple GAG attachments. Uridine diphosphoglucose dehydrogenase (UDPGD) is the enzyme responsible for the production of uridine diphospho(UDP)-glucuronate, an essential monosaccharide in the biosynthesis of hyaluronan, which is found in high concentrations in normal synovial fluid. Synovial lining cells have been implicated in the synthesis of hyaluronan, but the degree to which they are adapted metabolically to this function in normal and inflamed synovium has not been established. Using a quantitative cytochemical method it was shown that synovial lining cells from chronically inflamed rabbit synovium had significantly lower UDPGD activity per cell than the lining cells of normal synovium. These findings suggest that the lining cells of normal non-inflamed synovium may be enzymatically adapted for the synthesis of hyaluronan and that this may be an indication of a specific role of synovial lining cells in the maintenance of normal joint function. ...UDP-xylose is a potent inhibitor of UDP-GDH but inhibitory concentrations of UDP-xylose could not be detected in cell extracts.